How do you guys like your eggs? When I was little I was a straight-up scrambled egg girl. And no soft slow scramble either – nope, I LOVED those rubbery scrambled eggs that they used to serve up in those styrofoam containers at McDonalds. That was a long time ago. Now, I’m all about sunny eggs, runny yolks please. It’s funny how food tastes change. I’m pretty much a lover of all kinds of eggs now, but I still get really egg-cited (heehee sorry, not sorry!) when I see a new way to make eggs. It’s no secret that I love frico cheese – that magical thing that happens when cheese sneaks out of your grilled cheese, melts in the pan, and then caramelizes up into a crispy-crunchy lacy cracker. If you like the toasty sides of lasagna, or the extra-browned cheesy parts of pizza, then frico cheese is for you. I’m not sure why, but in the restaurant world, fricos are usually relegated as garnish. Maybe you’ve seen them: lacy rounds of parmesan added to soups or salads. I have no idea why frico isn’t more celebrated. It’s one of my favorite ways of eating cheese. As a lover of crunch and cheese, crunchy cheese is definitely my kryptonite. If I had to choose between crunchy cheese and eggs I wouldn’t be a very happy bunny. 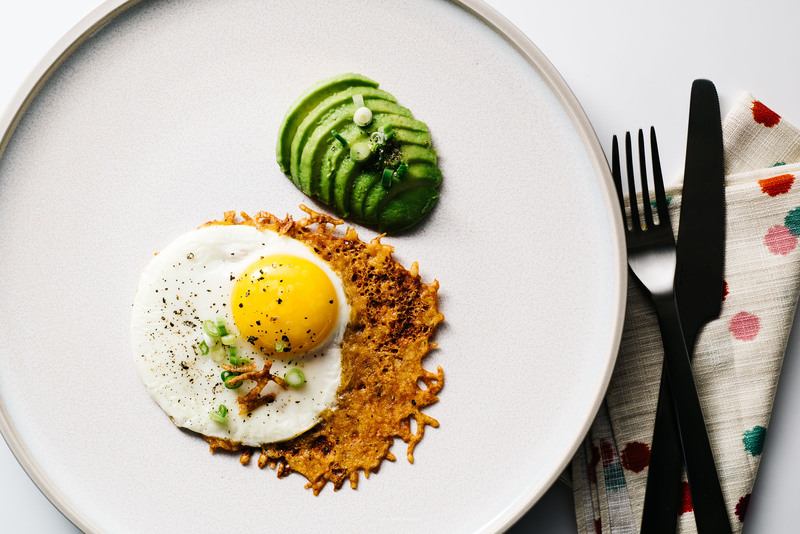 Thankfully, I don’t ever have to choose because now, frico cheese and eggs have come together forever in delicious, delicious harmony. What’s even more beautiful is that making cheesy, crispy eggs is incredibly easy. I know I’m being a touch effusive, but I’m really excited about these guys. 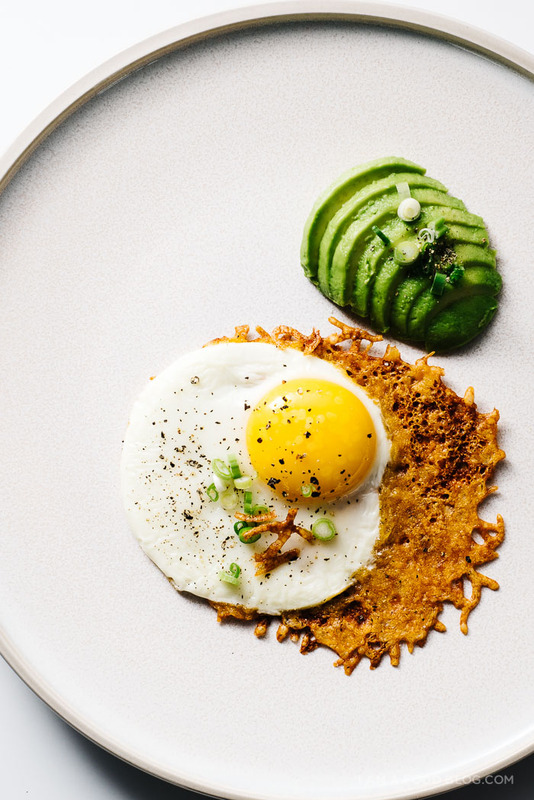 Frico eggs are essentially a grilled cheese and egg sandwich, hold the bread. So crispy, so cheesy, so GOOD. Heat up a heavy-bottomed, non-stick pan over medium heat. Sprinkle the shredded cheese in the centre of the pan, in circular shape. You want a thin, even layer. 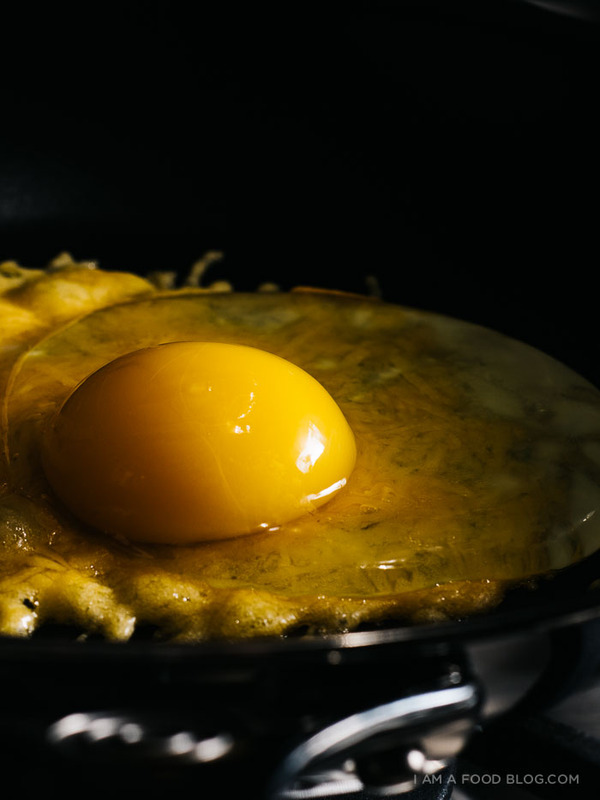 Once the cheese melts a bit, crack an egg on top, cover with a lid and cook to your desired doneness. I find it helpful to use a glass lid. Remove from the heat, let sit for a minute for the cheese to crisp up and then loosen by sliding a silicone spatula underneath. Plate, season with salt and pepper and enjoy hot! Feel free to toast up some soldiers to dip into your runny yolk. I kept it carb-free and had mine with some avocado. This is my kind of carb free food! Crispy cheese bits are the best part of any cooked cheese! Love it! Omg, this egg is a work of art!!! I’m bad at making sunny eggs. Sometimes I feel like it hates me. But look at this shinny little thing here! I’m going to give it another shot! Ok, I’m going to marry these frico eggs. I just did one of those circa 1980’s Billy Blanks Tae Bo DVD’s and I’m starving. And wow, doesn’t brunch just seem so wonderful. I love your idea of posting brunch recipes every Sunday, very nice. Scrambled egg girl here, doing my best to step out of my comfort zone. That sounds like a very nice sunday morning hangover dish! Will definitely try it! These eggs look SO good, Stephanie! And your photos are perfection. These sound delicious! Cheese and eggs belong together! I’m definitely a sunny-side up, runny yolk kind of girl. With biscuits or toast or bacon or SOMETHING to dip in the yolk. 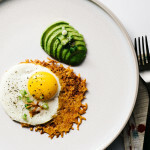 These frico eggs look so tempting! Cheesy skirts 4eva. ♥︎♥︎ And rubbery eggs used to be my jam, too. Funny how things change! Yum! Eggs are delicious and so versatile. 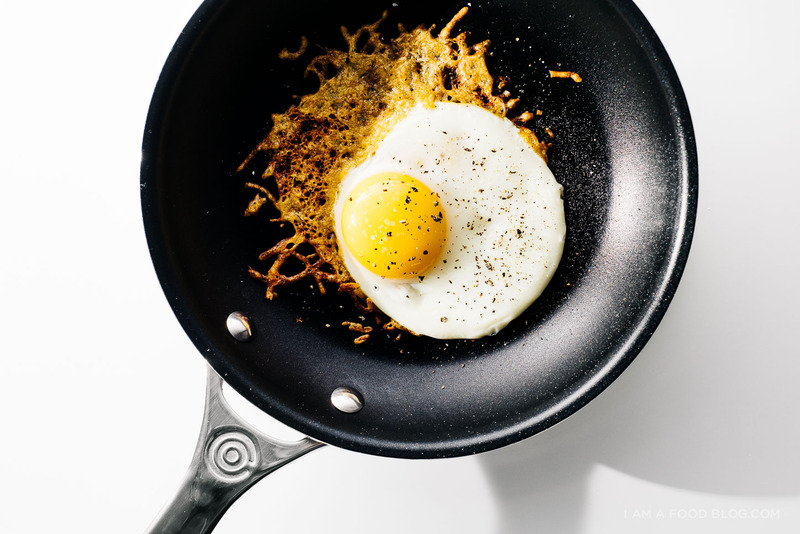 I will definitely be adding this little egg trick to my recipe repertoire. Thanks! Gosh, this looks good! 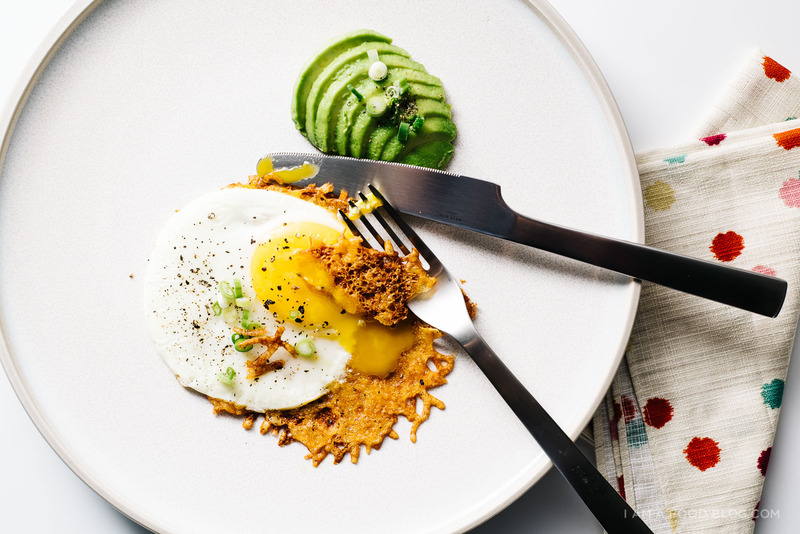 That yolk is just perfect, and I love the cheesy crunch. Good idea, and beautifully presented! I was just about to make an omelette, but going to make this instead! No carbs, even better hehe. I have a frittata recipe which I love too, but a fried egg is just as delicious! 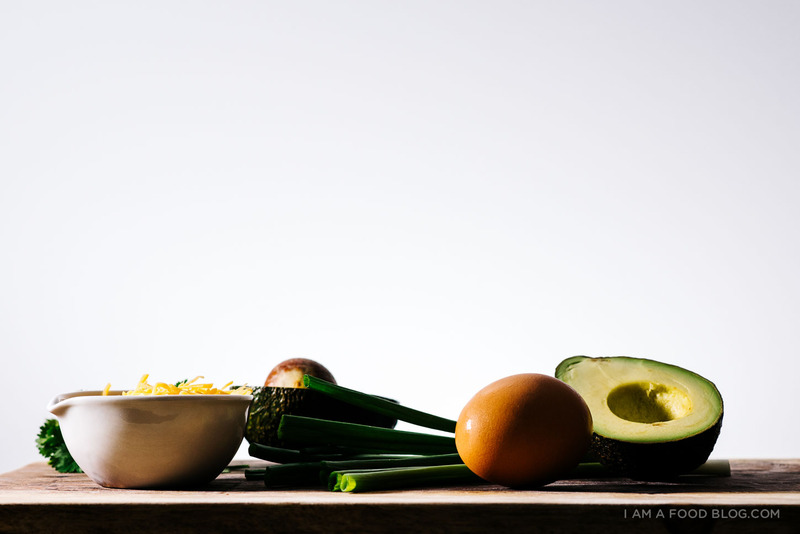 And avocado… yum! Love the photo! OMG this is brilliant. Why isn’t frico a part of every meal ever? WHY?! I’m so making this over the weekend. Thank you! What a neat idea to create the crisp under the egg. Looks great and adds such wonderful flavor and texture! I used to love super over-cooked rubbery scrambled eggs. At the point where they turn into little tiny egg nibs instead of a cohesive scrambled egg mass…haha. Oh my dear God this is brilliant. There is nothing better in the world than frico cheese. This is seriously my new breakfast, lunch, dinner adornment. I used to love plastic scrambled eggs, definitely grew out of that phase, it’s really all about that yolk. Love eggs and love a crispy cheese crisp. I do a parmesan cheese crisp on my burger. Thanks for posting. Deelish ! 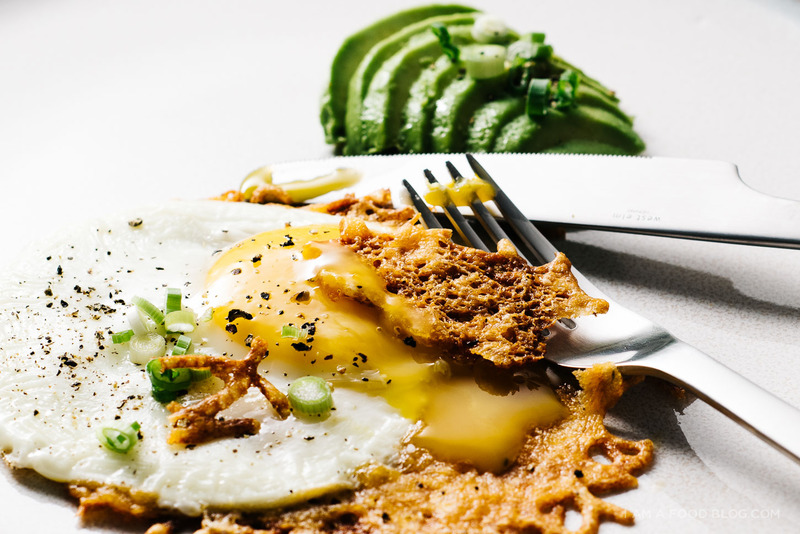 Here’s an idea to take frico eggs to the next level…. 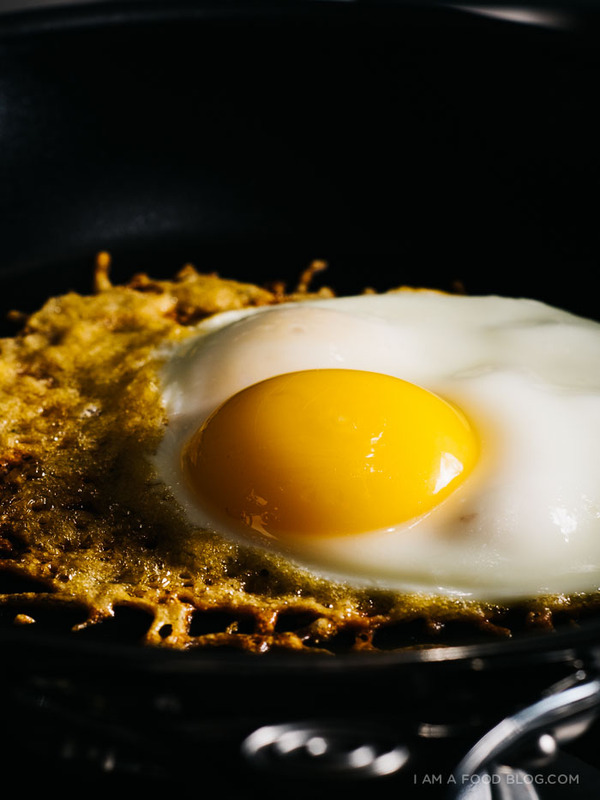 make the frico into a small layer on the bottom of the pan and add the egg like you did, but make the layer of frico a little sturdy. Sturdy enough to instantly become a frico taco!!! Add your avocado, pico de gallo, bell peppers, or anything else you think would be awesome on a breakfast taco and you got a portable breakfast.